Much of business today is conducted on the move; people must be transported, cargo must be delivered, and important components must be picked up on time. For all these to be completed successfully, you must also be able to communicate quickly and instantly with your mobile workforce. The CM200d is an ideal solution for safe push-to-talk communication between your office personnel, management, and your drivers on the move. 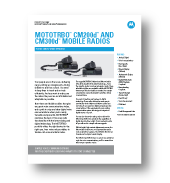 The Motorola CM200d is available in both Analog and Digital technology. This gives you the power to upgrade your system as your company needs it. 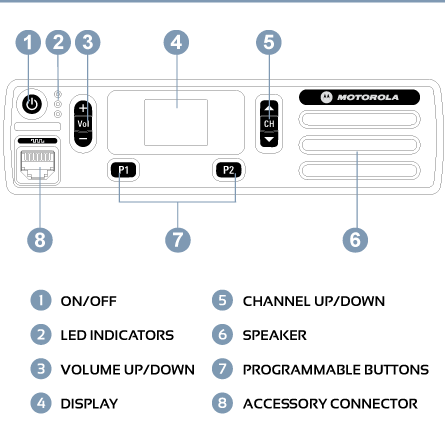 This radio can operate in either Analog or Digital concurrently, and even has the Dynamic Mixed Mode repeater functionality which automatically switches between the two, making your transition as smooth as it gets. With its Dual Capacity Direct Mode, the CM200d allows for double the channel capacity per frequency without the use of a repeater. This feature creates 2 voice paths within the same frequency; delivering more channel availability, and less time spent waiting for a clear channel to speak on. Of course when we discuss communication while driving, we run into safety concerns. With the Motorola CM200d, there is no reason to worry. Unlike cellular phones, mobile two-way radios are not restricted by the US Department of Transportation and are perfectly legal and safe to use while operating a commercial vehicle. This Wireless Remote Speaker Microphone gives users an additional 60-100 meters of room to move away from their mobile device and still be able to transmit and receive messages, and with a 28 hour battery life, it's sure to run the full length of your shift. This wireless speaker microphone is designed for use with mobile two-way radios. It extends your microphone range up to 10+ meters outside your vehicle, so you can stay connected while working faster and more efficiently. When placing an order for a CM200d, be sure to add the right antenna for your radio (UHF or VHF) to your cart.These parts are NOT included with the CM200d, so be sure to add them to your cart! Whether you prefer to attach your antenna to the roof of your vehicle, or the trunk, this mount will keep your antenna securely attached and working properly. This part is NOT included with the CM200d, so be sure to add it to your cart!